If you've managed to get through the last couple of Hardware Schools on Nut Materials, well done. Hope your stamina holds out to take a look at fitting a nut. Materials are only part of the picture. 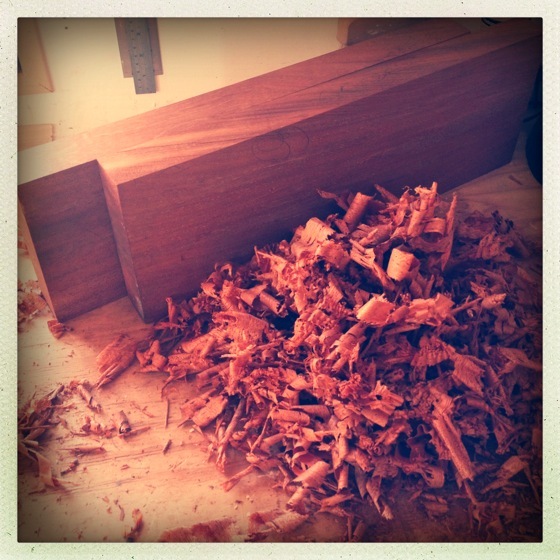 For a nut to do a good job, it must be properly fitted and well slotted. Proper fitting is really important. 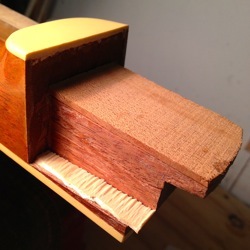 Apart from the aesthetics and feel, a nut must make good, solid contact with the neck and fingerboard if it's to work well. You don't want the nut to impede a string's vibration and a less-than-solid contact between nut and neck is a recipe for sucking out string energy. 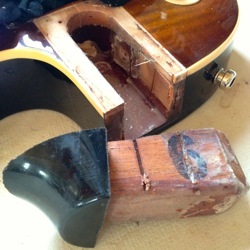 In the same way that soft plastic nuts can soak up vibration, a badly fitted nut can also kill your tone. You're looking for a solid, even contact along the bottom of the nut and along the front surface (that butts against the fingerboard). In an ideal world, we don't want to see shims under nuts and any softer shims are definitely out. It's worth mentioning that I occasionally use bone shims. While the first choice would be to replace the nut, a bone shim can do a decent job if that's not an option. 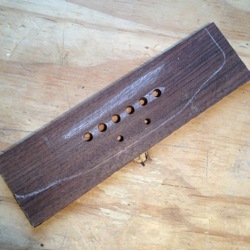 Each string slot in a nut must first be properly spaced. Generally, this spacing isn't the same across the fingerboard but increases very slightly as it moves from 1st string to the bottom—as the strings' get thicker, the spacing gets bigger. We're not talking about very much of a difference but you'd be surprised at how unpleasant things feel if the spacing is incorrect. After spacing, the next job is string height. 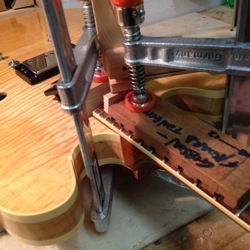 Each string-slot in the nut must be correctly cut to give the optimal setting for that string. 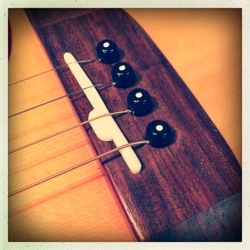 If the slot is too low, the string will probably buzz off the first fret when it's played. 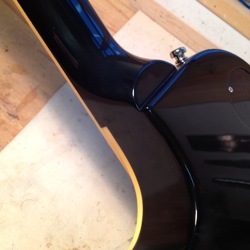 If the slot is too high, playability will suffer, as will intonation. 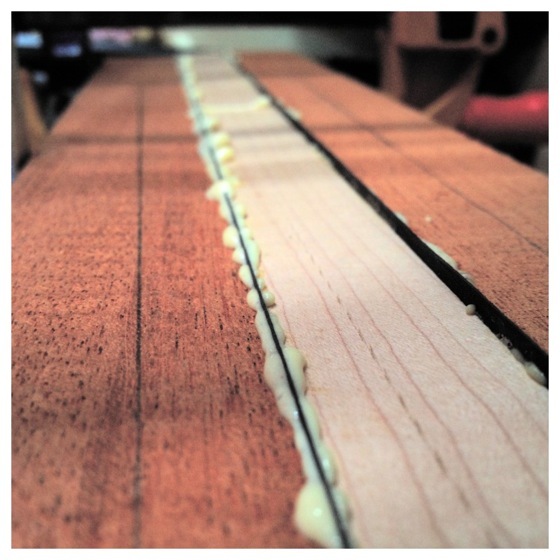 A too-high slot means you'll need to stretch the string farther when fretting, especially in the lower positions. This can definitely kick out your intonation and make for nastiness. Finally, the string slots need to be the right size for each string. I have a lot of gauged nut-files. Each is a slightly different size. I can pick the right file for each string-slot, matching it to the string that it will hold. 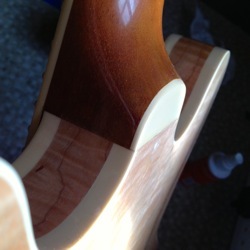 Too big a slot—say a .042" slot holding a .016" string—will allow a	string some sideways movement which isn't ideal. Worse, however, is too small a slot. 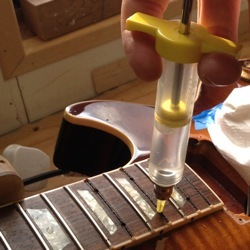 This can bind and pinch the string, often causing tuning issues. 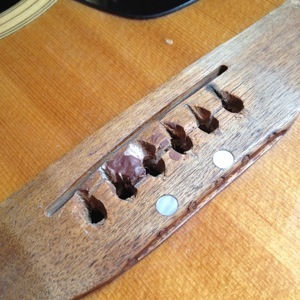 If you've ever had a string 'ping' as you tuned it, you might have too tight a slot (or the string has begun to wear the slot, basically cutting its only slot and catching in that). You might think this is the same thing as height but there's an extra component to think about. 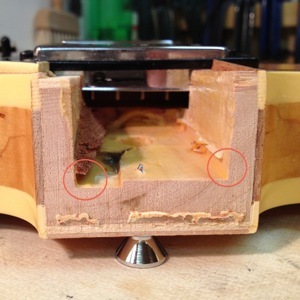 After the slots are cut, the excess nut material above the slots should be removed. While there's an argument that this is (at least partly) for reasons of tone, in my view, it's mostly because it's ugly. Big deep slots and a quarter-inch of nut above the strings just looks a bit rubbish. 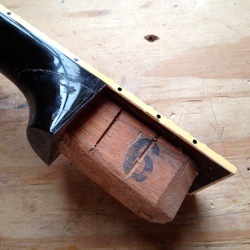 Ideally, your wound strings should have about half to two-thirds of their diameter in their slots and the unwound strings should sit just below the surface. For the most part, any nut I make (whether bone or one of the alternatives) is cut from a blank. This is just a hunk of that material that I cut to size and shape before slotting. This allows me to get the best fit and look for my nuts. However, many nuts are available as pre-cut and pre-slotted pieces. Personally, I don't really like these but I have the luxury of having the correct tools and a bit of experience. I realise that pre-cut nuts from Tusq, or similar material, can still be an excellent home-fit upgrade from a guitar with a cheapie plastic nut. If you're doing one yourself, remember that it's not usually a case of just dropping it in. They'll usually require a little sanding and shaping to fit properly. In the absence of gauged nut-files, height adjustment on these is done by removing material from the bottom. This can make for an awkward balancing act to get things right across the bass and treble sides of your neck so go slooooooooow. It's a pain, but do a tiny bit at a time and keep putting the nut back on and retuning (always check when tuned to pitch) to see where your string height is. 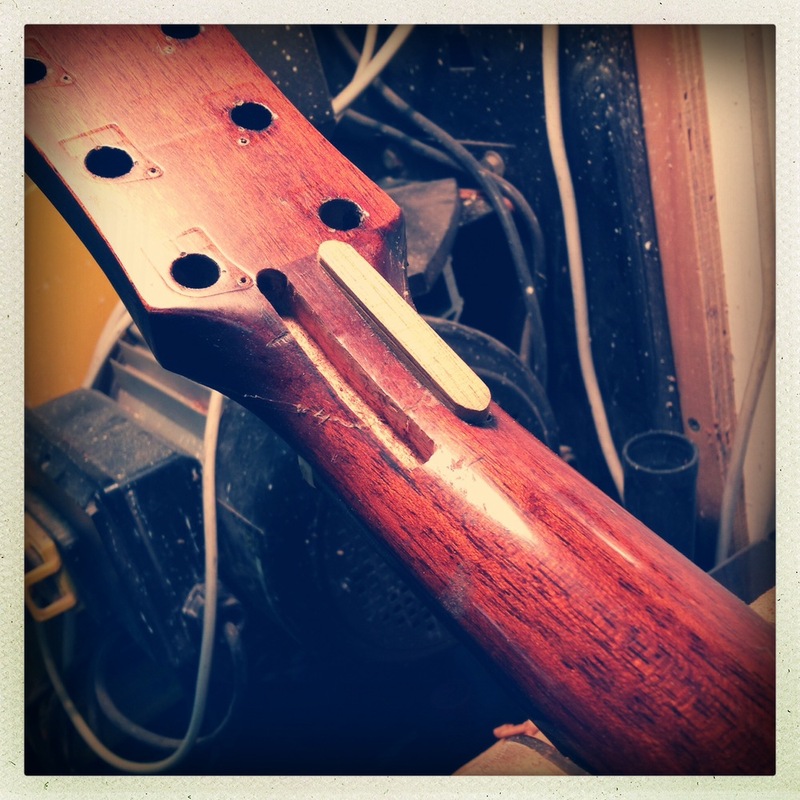 I rambled on about acoustic guitar intonation a while ago and mentioned that sometimes, the proper intonation point for a particular string falls somewhere fore or aft of the actual saddle. 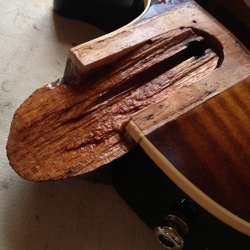 In some cases, all of the instrument's other strings do likewise and this can be an indication that the saddle slot may be in the wrong place. Often, however, it's just one outlier. One lonely string, steadfastly blazing its own out-of-tune trail. An intonation maverick, if you will. It's not always a big deal. Perhaps it's just a little out or, perhaps your ear/brain isn't particularly bothered by it. However, if you're one of those cursed with tuning-sensitive ears or if your poor, perfectly-pitched brain screams in discordant agony when you play certain chords or intervals, you might want to consider drastic action like this. Well, it's not terribly drastic, really. I've made a new saddle for this tenor guitar from a bone blank and all strings except the third intonated quite happily. The delinquent string wanted to intonate miles away from the saddle. So I extended the saddle. There are a couple of options for this but the most straightforward is an additional piece of bone that's been glued to the rest of the saddle. It's half the height of the saddle itself—it lacks a 'bottom' half and it actually rests on top of the wooden bridge so it's completely reversible (just pop a new saddle in). 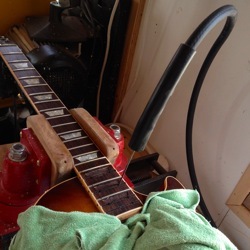 It gives me the additional scope needed to shift this string's intonation point forward. Looks odd but sounds much better. The time has come. Tomorrow morning (Monday 16th July), I'll be down with the lovely people in Radio Nova to present the Haze Bassmaster 6 to its new owner, Greg. Greg won Nova's Rocktober competition and his prize was a custom, hand-built instrument from Haze Guitars. After some discussions, the Haze Bassmaster 6 (with a few tweaks) was decided upon. Thirty inches and six strings. The Bassmaster is a wonderful, quirky, beast with a tone that'll get you noticed. This one looks great with a lovely ash body peeking through that burst. Nice. 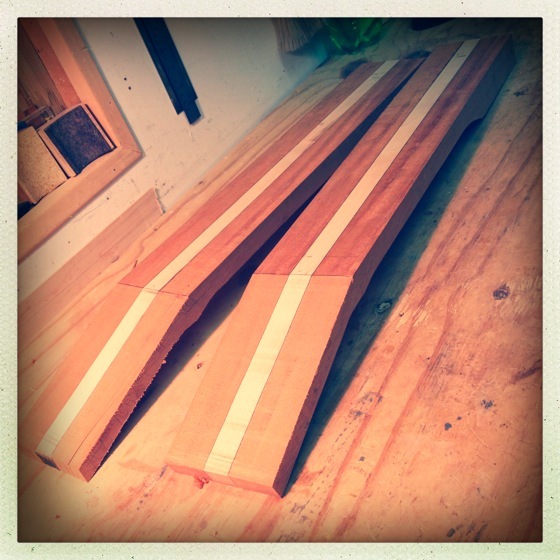 You can check out the build process for the Nova Bassmaster if you like or you can read a little more about the Haze Bassmaster 6. More images to come but do tune in to Pat Courtney on Nova tomorrow morning (100FM) and you might get to hear a bit more. Hurrah!